For some time now, accordionist Eddie LeJeune has been a quiet fixture on the prairie Cajun music scene. He never pursued the bright lights or followed current trends but has always offered an honest soul-searching examination of his traditional Cajun music. The son of the legendary Iry LeJeune, the 47-year-old LeJeune has endured unjust comparisons with his father’s legacy that could have been damaging to his musical development. 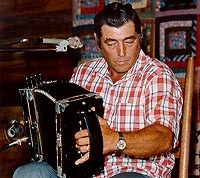 As evidenced by his latest album on Rounder Records, Cajun Spirit, LeJeune’s rich, generationally removed, older style of playing is uniquely his own. Dan Willging caught up with LeJeune to learn more about his technique and philosophy. Dan Willging: The thing that interested me was your accordion style. I listen to a lot of Cajun music but I don’t hear lot of people playing like you. Eddie LeJeune: Right, it’s a real hard and pure style. It’s completely original what I’m doing. It comes from the heart, I changed the style a little bit to fit the purpose I was trying to accomplish. And that’s the traditional aspect of the accordion. It is giving it a real traditional sound. It’s almost when you listen to it, and you didn’t know any better, it would sound like it was a tune that would have been played back in the forties and the fifties. Do you get that feeling on that? Yeah, and it seems earlier than that. I was wondering if it was like Cajun music in the twenties. When I think of a trio like yours, I think of the twenties with Joe Falcon. Basically, based on that same aspect of traditional music, the only real difference is that we have so much more technology today that they can really bring the sound out bigger and cleaner than what they did in the past. It brings it way forward, but the presence still sounds like it’s in the thirties and forties. About a week ago, we were playing your album and the Karlo Broussard album, and we were comparing the difference in styles. He goes fairly fast, you go a littler slower but play more notes and there’s just a lot of technique with your playing. Because we’re a three piece, I am doing everything that I can to fill all spots. You’re playing rhythm and bass notes too. Yes I am; I do it all. That’s the way I learned and that’s the way I grew up playing. Depending upon your ability, you can change your style a little bit and do whatever fits you. Your playing is very rich. There’s just a lot of subtle technique going on. The one thing that I wanted to understand is that I hear some squeally high notes every once in awhile. That’s identification. It’s a marker, a strong point, it’s a sign that you’re totally in control. You can do literally whatever you want. It’s a sense of control, it’s also a sense of timing and coordination. Lot of songs that I play, there is a lot of coordination involved. You also want to take the coordination and blend it in with technique and lot of the notes that you hear are drive notes. It’s to let everybody know that hey, I’m secure, just hop in and come along. Right, and it’s going. I’m ready, I’m there and I’m fully aware of everything that’s going. All they have to do is hop in and join the ride. How did you learn to play the accordion? Weren’t you a baby when you’re dad died? Yes, well, I was fortunate enough that my grandma played the accordion. She would take the accordion out and we would sit down and watch her. Even at a young age, we knew exactly how that instrument was supposed to perform. And we just it picked up, started playing here and there, and first thing you knew, I was playing a tune. I started that out about six years old and by the time I was seven, I was playing. It wasn’t as rich as I’m doing now but you have to start somewhere. I made my start, and I come up a long ways, I come up following a big legacy of musicians especially my father. There was a lot of times when I was growing up, I didn’t find myself competing for him, I was always used as an example - you’ll never be your father. Well, I never tried to be my father. I always tried to do was play my instrument to the best of my ability and play his music. And today, people are starting to recognize that I’m my own man now. I have my own style. I’ve paid my dues and to live up to somebody as well known as my father was, you have to understand that I’ve earned my rights in the field of music. So your style is what you want to make of it. You never tried to copy your dad’s style off his records? I listen to my father’s music and I play his music, but I don’t try to copy his music note for note. I play his songs and I develop my own style through my own technique to his music which gives me identification. That’s the sign of identification, in other words, I’m my own man even though I’m playing my father’s music. And that is what a lot of the high notes are, those shrills that I do and it’s all coordination and control when you’re playing music and rhythm as well. Guitar and fiddle players, they give you the rhythm but they have to have a rhythm to follow. You carry a good rhythm on the accordion, it makes it so much easier for the guitar and fiddle player. You just have to join in. Accordion players don’t set the rhythm as much these days, do they? Accordion is supposed to set the rhythm and the timing. And the instruments are supposed to fall behind the accordion. It’s just like whenever you’re doing drums, that’s was one of the biggest things I found with drummers, that it was always hard to get a good drummer because when the drummer sets the timing, he could speed you up or slow you down. And if he did that, he was taking away from your ability; he was taking away from your technique. And that’s why for fifteen, eighteen years now that I haven’t used a drummer. I struck out and went with a three piece. Because the only thing that the drums were doing for me that it allowed me to play in the nightclubs and dancehalls and there were places around here telling you what you had to have in the band to play for them. And a lot of times, I was called after I quit using a drummer to go and play a dancehall, and I would say sure, and we would make the arrangements. They would ask me how many we had in the band. I would tell them three pieces and they would say, you have to have this and you have that, and I would hang up. And that’s the way to do it. If that’s what he wanted, he should have respected me for being honest with him - I have a three-piece band and this is my repertoire. But they went beyond that. They were telling me what I had to have in the band to play for them. Exactly. I have sat in with bands with the whole nine yards and people come up and tell me, boy you sound good behind all of that. But I’m not happy with all of that. I’m just happy as can be with my little three-piece band, accordion, fiddle and guitar. From time to time, I may add a triangle. That’s the music I want. If I could go back to the forties, would I hear more people playing the style you play today? Yeah you would, because you have less instruments in the band. Mind you not everybody can do a three-piece band because you really have to be on your toes. You have to drive, coordinate your rhythm yourself, coordinate your timing through yourself. Fiddle players and guitar players are really keen of following behind on what you’re doing. And they just keep up the tempo that you set. And that’s the way the drummer should do also. A really good drummer will do that. Just fall behind the accordion and keep the timing for the rest of the instruments. Do you guys play a lot of dances with a three-piece or is it limited? No, it is limited. No, I don’t do dances at all anymore. The only dances I do are private parties. And that’s because they can hire a three-piece band cheaper that they can hire a full band. The amazing thing about it is that everybody is so satisfied at the end of the night because they can actually hear and understand all of the instruments in the band. Nothing is louder than anything else. Everything is set at the same level. And everybody can distinctly hear each instrument. It’s so much purer and cleaner and more original. That’s what I hear in the record. Sometimes you hear one player overshadowing another, so you wonder is one part weaker than the other? Is this guy an ego-maniac but I don’t hear that in your record. The only thing you hear overshadowing everything is my weak vocals. No, I like your vocals. It’s pretty strong. It’s always been a factor when we always played house dances, and I grew up playing house dances, parties, we didn’t have all of this amplification and everything was played strictly acoustic. And for people to hear and keep the beat going, well, when you had to sing pretty loud so everybody could hear you. And the instruments were loud enough, depending on where you were playing and how big the room was but normally everything was set to serve the purpose of the room. Is that why the Cajuns sing that way, the crying vocal? It’s very distinct. I kinda have my own style in singing as well. I kinda of roll my voice, it’s kinda of a yodel while I’m singing some of the songs. I am really pushing from the heart when I sing. There is a lot of feelings in my singing. That draws the dividing line from somebody going up to the microphone and raising the microphone loud enough so they can be loud where he doesn’t have to push or nothing. I push. So, you don’t use a microphone? I do when we are touring. You play big assembly halls and theaters, things where you really have to have them. I never set my microphone as high as anybody else for the fact that I want to drive where you can hear my vocals. That’s my style and that’s one of the reasons why my father’s vocals were different than anybody else’s and that why mine are different than anybody else’s. I’m proud of what I’m doing because when I do it, I feel good. And anytime you feel good about something you’re doing, you’re giving it one hundred percent. I was thinking about you the other day when I was listening to a track of yours on the Rough Guide to Cajun Music. I remember in 1995 you were saying you were going to have a record out soon but I guess these things take a while to get going? Yeah they do. I am especially proud of the new one that come out - Cajun Spirit. It stands alone. When you put it against any of these other musicians that are playing, and I’m not saying mine is any better than anybody else’s, it stands alone. It has its special techniques, it has its own identification. Right, it doesn’t sound like anybody else’s record. It sounds like your record. Everybody thinks Cajun music has to have a big dancehall sound and it doesn’t. It’s really not where it is at. It’s really our music and our music has to be delivered from the heart. And the only good thing I got going for me is that I’m doing it in its natural state with the original trio. And I’m always so much more comfortable with a trio than I am with a bigger band. It seems to me that you got this bigger band, you can be lazier and I’m not saying that you can’t play the music but you don’t have to play as hard. You can lazy around in a lot of areas because you’ve got all these instruments pushing you. And I find that today, it’s one of the things that takes from musicians is that they have all these instruments behind them to make them sound good. Put these musicians in a three-piece band, they can’t do what they’re doing on the album that they cut. I see, the focus is more on you. You are probably pretty tired when you finish playing. I am exhausted. I do two forty-five minute shows. When I get done with my second show, my shirt is soaking wet. I just put out 110 percent. I put my whole heart and soul in it.